Kaitlin Beck is the K-3 General Music Specialist at DC West Elementary School in Valley, Nebraska. Outside of school, Kaitlin is the Associate Director of Choirs and the Director of Marketing and Development of the Omaha Children’s Choir. At OCC, Kaitlin directs the Urban Harmony ensemble and enjoys working with budding choral musicians. Within the community, Ms. Beck enjoys directing the Alleluia, Amen! children’s choir at Westminster Presbyterian Church and teaching her students basic ukulele. In the past, Ms. Beck served as a long term music substitute at Trumble Park, Blumfield, Seymour, Golden Hills, and Patriot Elementary Schools within the Papillion La Vista Community Schools and Ralston Public Schools districts. Kaitlin graduated in 2016 with her Bachelor of Music in Education with an emphasis in K-12 vocal music from Nebraska Wesleyan University in Lincoln, Nebraska. When in college, Kaitlin served as the Cherub Choir Director at Westminster and was more than excited to come back to work with the older students in Alleluia, Amen! A passionate researcher, Ms. Beck was the winner of a student-faculty collaborative research grant at NWU in 2014, taking her to Washington, D.C., to study the transmission and interactions of cultures and music at the Smithsonian Folklife Festival featuring the bio-diverse nation of Peru. Kaitlin’s research findings from this grant were presented at the 2016 NWU Spring Student Research Symposium, the 2016 UNL No Limits! Gender Conference, and the 2015 Wartburg College Regional Midwest Undergraduate Conference in the Humanities. Recently, Ms. Beck and her OCC colleague, Amanda Stevenson, presented research at the 2017 summer Nebraska Choral Directors Association conference and the 2017 Iowa Music Educator’s Conference. 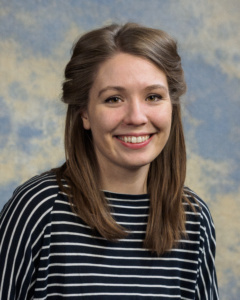 Outside of academic research, Kaitlin is an active member of the Great Plains Orff Chapter (GPOC), American Orff-Schulwerk Association (AOSA), and the National Association for Music Education (NAfME). In the future, Ms. Beck hopes to pursue a Masters of Music Education in Orff-Schulwerk.